The first general American military draft was enacted by the Confederate government on April 16, 1862, more than a year before the federal government did the same. The Confederacy took this step because it had to; its territory was being assailed on every front by overwhelming numbers, and the defending armies needed men to fill the ranks. 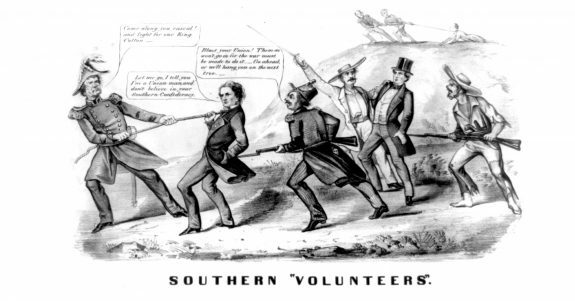 The compulsory-service law was very unpopular in the South because it was viewed as a usurpation of the rights of individuals by the central government, one of the reasons the South went to war in the first place. Under the Conscription Act, all healthy white men between the ages of 18 and 35 were liable for a three-year term of service. The act also extended the terms of enlistment for all one-year soldiers to three years. These are the original exemptions included in that first conscription law. Additional exemptions were added later. superintendents and operatives in wool and other factories, who may be exempted by the Secretary of War, shall be, and are hereby, exempted from military service in the armies of the Confederate States.